WASHINGTON (Sept. 08, 2010) -- Nine years after the Sept. 11, 2001, terrorist attack on the Pentagon in Washington, D.C., visitors come night and day to reflect at the memorial built on the site to honor the victims. Just west of the Department of Defense headquarters, the memorial park features 184 stainless steel benches, one for each victim of the attack, each set over a lighted pool of water. 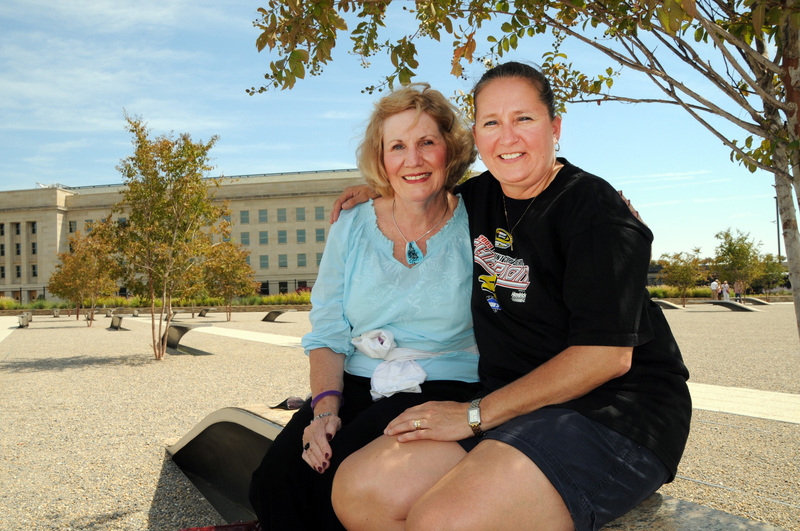 Cynthia Koebeler and Brenda Abplanalp, coworkers and longtime friends from Indianapolis, Ind., visited the Pentagon Memorial park Sept. 7, just days before the ninth anniversary of the attack. The two both say the attacks have had an effect on the way they think and have brought them closer to their families. Cynthia Koebeler and Brenda Abplanalp, coworkers and longtime friends from Indianapolis, Ind., visited the park Sept. 7, just days before the ninth anniversary of the attack. A warm day, with a blue sky, and with the Pentagon looming large in the background, Koebeler and Abplanalp were willing to discuss what they both agreed was a fitting memorial to the victims of the attack. "The lights underneath, you want to reflect back and forward," Koebeler said. "I guess I think that's what the lights mean. You're reflecting this way -- we thought we were impervious to all this. But we did get attacked, and it reminds you of how many innocents are here." Koebeler said she hasn't been to the nation's capital in a long time -- and was visiting at the invite of Abplanalp, whose husband makes frequent trips to the city. "It's been a long time since I've been to D.C., and I just wanted to see the 9/11 memorial," Koebeler said. "Early on, it was too raw. But now it feels -- it is nine years -- I just want to see what the completion was for this memorial." Abplanalp said she was already at work when she heard about the 9/11 attacks, and said there wasn't much discussion among coworkers as they watched the news story unfold on televisions in their building's elevator lobby. "Somebody said a bomb struck the World Trade Center -- we didn't even know it was an airplane," she said. "And just as we went out there, that's when both buildings came down. We were stunned, and nobody knew what to say or do. The only thing we were thinking was we need to get home." Koebeler said she heard of the attacks on the car radio and had to pull off on the side of the road to make sense of it. "They didn't say the word attack," she said. "I thought that's odd. The radio announcer kept saying something's wrong, the plane had hit the building. I went on to work and the second one hit while I was at work. Our whole office just really was quiet and we gathered around and not too many words were exchanged. We didn't know what to make of it." Abplanalp said the 9/11 attacks have made her think more now about what she does, that it has affected her life. "This could happen at any time," she said. "It keeps you closer to your family. You talk to people that you haven't talked to in years. You don't know what will happen." She said that she and her family have discussed what would happen were an attack to affect her family more directly than the ones from nine years ago. "We talk about it -- not all the time -- but we talk about it, especially me and my husband," she said. Koebeler said she and her family have discussed other potential attacks, possibilities beyond what happened on 9/11. "I think you become more circumspect because you think: where will they go again," she said. "Instead of New York, maybe it's Miami. Or maybe it's not even a bomb. We speculated about maybe water being tainted, or some other way they will get to us. We are doing all of our efforts at the airport and maybe they have switched strategies, and that's scary for us. My kids and I talk about that." The after-effects of 9/11 are far-reaching, especially those related to the conflicts in Iraq and Afghanistan. Abplanalp said a friend of hers at work has twin sons who serve in the military. And she has seen the effects of the war on that family. Her friend's son, she said, had taken a life in combat during his deployment and now suffers repercussions from that experience. "He suffers from PTSD -- that's the first time he's killed somebody," she said. "I think that's when it became real for her. Listening to her talk about it -- I was crying because of what happened to her son. I can only imagine if it was my son. I'm scared for them and I hate when they have to go over there. I can only imagine being a parent of that son or daughter and having to send them over to fight." While neither Koebeler nor Abplanalp knew victims of the 9/11 attacks personally, several employees from their company were either injured or killed in the attack on the World Trade Center towers in New York City. Their company had an office there. They both agree the attacks have changed everything for them. "I don't like all the loss of life," Koebeler said of the resulting wars. "Every night I turn on the local station, and somebody has lost his life -- that's sad. It has changed our world outlook." "It's put our world on edge," Abplanalp said. "It keeps their eyes open." On Saturday there will be a memorial ceremony and wreath-laying at the Pentagon Memorial to remember Sept. 11, 2001. The memorial is open to visitors 24 hours a day, every day of the year.